One of the reason’s that the Vikings have achieved success in their two wins (out of 3) is because their quarterback had time to throw, and the Bucs and Saints quarterback didn’t. The game of football is complicated, surely the most complex team game in all sports. However, even the Patriots won’t win frequently when Tom Brady is harassed and hurried to throw, and spends too much time on his back. While the Viking offensive line is not the second coming of the mid-1960s Green Bay Packer unit, they have begun to gel, and it shows in both the run blocking, and the more exotic nature of the passing game that Offensive Coordinator Pat Shurmur is allowed to deploy on game day. Pat Elflein is a major upgrade over the combination of Joe Berger and Nick Easton. Elfein is but has incredible athleticism and quick feet, which allows him to move fast enough to get out and lead screen passes and sweeps. Meanwhile, Berger is more natural at the right guard position. Nick Easton is having some growing pains as he switches from Center to Guard, but even with a few early season penalties, he is a more reliable run blocker and pass protector than the over-priced Alex Boone ever showed in Minnesota. Which leaves us with the Tackles. A position that was like a swinging gate in recent years, as the starters there would simply say “Ole” and let their defender get a straight shot at their quarterback. In fact, with TJ Clemmings regularly manning one of the two tackle positions the last few years, Sam Bradford and Teddy Bridgewater are lucky they can chew solid foods. Reilly Reiff is still catching up after missing the majority of training camp and the preseason, but he is reliable and steady. Meanwhile, Mike Remmers had his best game as a Viking on Sunday. As Pete Bercich says, none of these guys are Pro Bowlers (although Elflein might be soon), but the sum is much better than the individual pieces. Most of all, when they are deficient, it is a consistent deficiency that Viking line coaches can scheme around. The result? Two games where different Viking starting QBs threw for monster yardage and QB ratings above 140. This has allowed Shurmur to open up his vertical passing game, because his signal-callers have the time to look deep. In the NFL, even a second-tier quarterback who is accurate(read that as Case Keenum) can have a field day against defenses, especially when the rules favor the offense. But it isn’t just the passing game. It is the a dedication to the run to mix things up and keep defenses guessing. Sure, for the past 9 seasons, Viking offensive coordinators were going to run Adrian Peterson up the gut in 8 and 9 man boxes. But, they knew he was always going to run, so they were better prepared to stop it. Now, defenses don’t know if 3-down back Dalvin Cook is going to run, block or catch a pass and burn them outside. He doesn’t have the raw power that a Peterson had, and is not as exciting when he breaks loose. But, make no mistake about it, he is the much better player at the running back position. Cook has the patience to let holes develop with his inexperienced line, and has an almost imperceptible wiggle in the hole that lets him find room to run. That’s part him and part this line, which can dominate the line of scrimmage at times. Best of all, there is no reason to believe the line play will regress. So, enjoy the 369 yard passing day, that came with 270 yards from the wideout spots including Stefon Diggs and Adam Thielen’s big days. Talk about our new running back who had 170 yards combined rushing and receiving, making us recall the days of the might Viking all-purpose back Chuck Foreman. Hail the defense for it’s ball hawking style and run stuffing defense. But, make no mistake, this team is thriving where it matters most, in the trenches, and on the line. 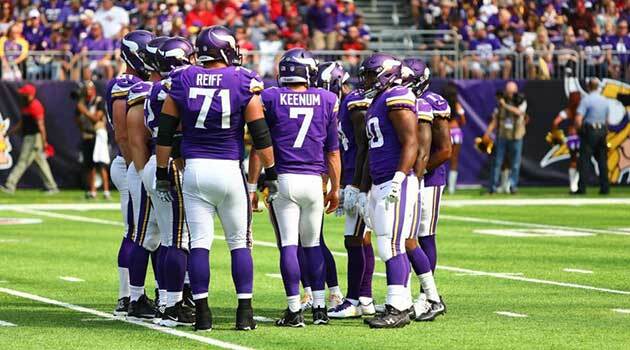 The Viking offense is back – Beware Packers, Bears and Lions!